Last Saturday night Adam and I got to go out on a date thanks to our dear friends and volunteer babysitters Lucy & Dave. One of my mommy friends had recently recommended a neighborhood joint – Lulu and Po – that I hadn’t tried yet, so off we went! It was a cool, rather fall-like evening and it felt good walking arm in arm with my man through beautiful Fort Greene (sans little one). The restaurant is an adorable, cozy spot and we were seated at a table next to the window. We ordered some cocktails and perused the menu. Though I didn’t see cheese on the menu, I must have sensed its presence so I asked the waitress if there was a cheese selection. There was. It was featured on the dessert menu. I’m glad I asked! As cheese is typically the star for me… I prefer to eat it in the beginning of a meal vs. the end, so we ordered two of the featured cheeses as a starter. The first cheese (top right corner of the plate) was Harbison – the newest cheese coming out of Jasper Hill Farm in Greensboro, VT. Made from pasteurized cow’s milk, it is a bloomy rind cheese wrapped in spruce bark with an oozy, creamy, silky texture. The bark gives the cheese an earthy/forest-y taste. I also got hints of garlic and mushrooms with a perfect saltiness. I thought it was totally delicious… like – eat it with a spoon and then lick the spoon until every drop is gone – delicious. They served it with spiced walnuts – a nice pairing – though I never really need anything but the cheese. 🙂 The people at Murray’s suggest cutting off the top of the wheel and dipping bread in it. It is that runny and scrumptious. I will most definitely have to give that a go. The second cheese was Olga – a firm, mixed goat’s and cow’s milk cheese from Seal Cove Farm in Maine. It is a washed-rind cheese, though it doesn’t have the stinky funky flavors typically associated with a washed rind. Instead – it hit me with a bright acidity, then left me with a salty and slightly caramel finish. It is a good cheese for snacking. They paired the Olga with quince paste, which balanced out the saltiness. 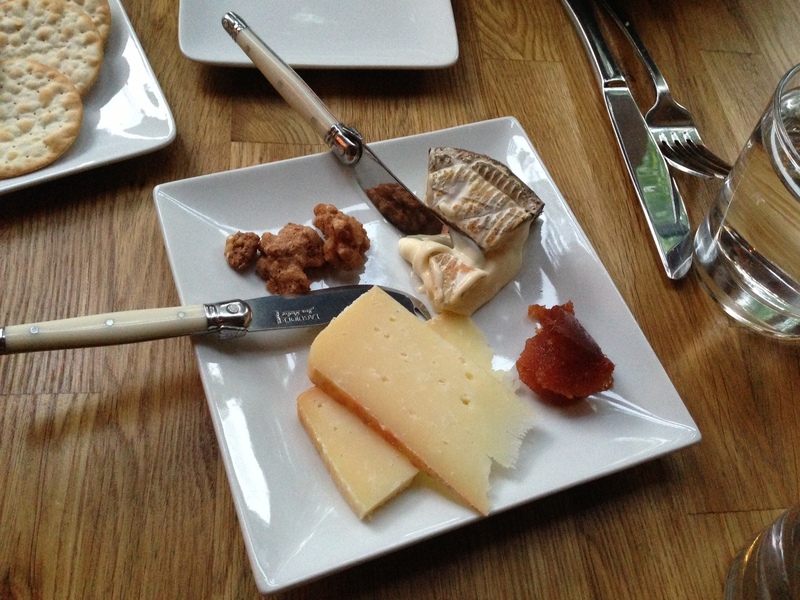 A really yummy cheese too… but the Harbison definitely won my heart for the evening. As for the rest of the meal, we ordered utica greens: pecorino, escarole, pancetta and garlic, burnt scallion fish: grilled with fried capers, aioli and lemon and my person favorite warm lentils & fregola: with salsa romesco and crème fraîche. This warm lentil dish was sooo yummy. It was comforting, stick to your ribs, coziness in a bowl. And crème fraîche is kind of an obsession of mine lately – ever since I made Jaime Oliver’s pasta with bacon and asparagus recipe. I want to try to recreate this lentil dish at home for sure. The meal was delish and it felt lovely to be out. We are total nerds though. We were done with dinner by 9:00 pm and secretly just wanted to go home and play Quirkle with Dave & Lucy. We were embarrassed to come home that early though, so we played a couple games of pool in our basement while listening to Sharon Jones and the Dap Kings on our neighbor Matt’s old time record player. Sweet evening all around! Oh – and by the way… I went out four times in the last two weeks – two dates with Adam and two nights out with girlfriends!! I’m getting my mojo back baby. Here’s to balance in 2013! Thanks so much Charlotte! Oh god that Harbison is good. I don’t know if you get American cheeses in Australia – do you? If not – you’ll have to bounce over here to New York and pick some up. Tell you what… if you ever come to Brooklyn, shoot me an email and I’ll pick some up for you and we can eat it together! You are such a great writer Fabulous read More!!!! ha! my friend just posted that on facebook too. I “liked” it instantly of course. Thanks for sending Rachel!